With inspiration from my first Summer vacation this year I hereby share this recipe on a cocktail, which were served at the hotel, where my mother and I stated in Alsace, called Basier Rose. We did not taste this appetizer at the hotel, but I noted down the ingredients mentioned on the menu card and based on this, I have created my version of Baiser Rose using both rose liqueur and cremant produced in Alsace. My mother and I have just enjoyed this cocktail on our return from our Summer holiday. We really did enjoy this drink. The rose flavour is delicate, so my good friends in Horses should be able to relax, if they read this post :-) The level of Martini should not be increased, as it otherwise will dominated the taste. Pour grenadine, rose liqueur and Martini into a cocktail glass. For the birthday lunch I did also make a cream cake with rhubarb compote and white chocolate cream using this recipe. The taste was great, however I could not get the white chocolate cream to work at all as it should. It took forever to whip the cream, which was cold enough to be whipped. And suddenly the cream turned into butter spread !! !, so I had drained off the "buttermilk" part. Therefore I did not have enough chocolate cream for the final decoration of this cake. 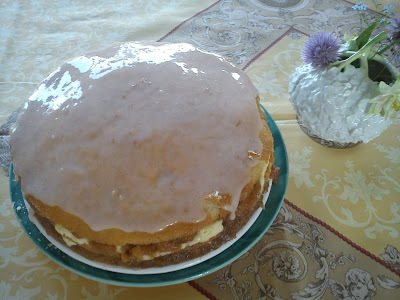 Instead of I made an icing from icing sugar and rhubarb cordial. Upon serving of this cream cake, the butter spread has set like a chocolate !!!! Stupid cake recipe, which I will NOT try out again never !!!! Bring the dairy whipping cream to the boil. Place the chopped white chocolate in a mixing bowl, pour the hot cream over the chocolate. Stir until the chocolate is melted. Store the chocolate cream cold in the refrigerator for minimum 5 hours. Add rhubarb, water, sugar, vanilla corn and pod into a cooking pot. Bring the compote to the boil, and let it simmer gently until the rhubarb pieces are soft. Before putting the cream cake together, strain off water/liquid of the rhubarb compote, so the texture does not become to runny. Remove the vanilla pod from the rhubarb compote and blend the compote together. Whip the chocolate cream in a cream foam. Start by placing one cream cake layer bun on the serving plate. Spread the rhubarb compote on the cream cake layer, followed by some of the whipped chocolate cream. Place the second layer on top, and repeat with a layer of rhubarb compote and whipped chocolate cream. Place the third layer on top. Decorate the entire cake with the rest of the whipped chocolate cream. If you do not have enough chocolate cream, you can also make an icing from icing sugar and rhubarb cordial.